Cody Willoughby | Troy Daily News Junior volunteer Cailyn Starnes helps Braxton Schultz, 4, of Tipp City make a peanut butter pine cone treat for animals during the annual “Winter Party for the Wildlife” on Saturday at Brukner Nature Center. The free event allowed participating families to enjoy arts and crafts, treat-making for wildlife, visits with the center’s resident critters, and a guided tour along the trails. Donations, such as bird seed, fruits and vegetables, and cleaning products, were requested to benefit the center’s wildlife ambassadors in 2019. For more information, visit www.bruknernaturecenter.com. 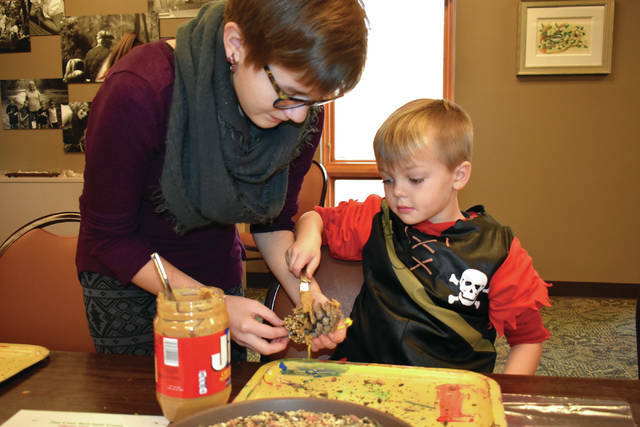 Junior volunteer Cailyn Starnes helps Braxton Schultz, 4, of Tipp City make a peanut butter pine cone treat for animals during the annual “Winter Party for the Wildlife” on Saturday at Brukner Nature Center. The free event allowed participating families to enjoy arts and crafts, treat-making for wildlife, visits with the center’s resident critters, and a guided tour along the trails. Donations, such as bird seed, fruits and vegetables, and cleaning products, were requested to benefit the center’s wildlife ambassadors in 2019. For more information, visit www.bruknernaturecenter.com. 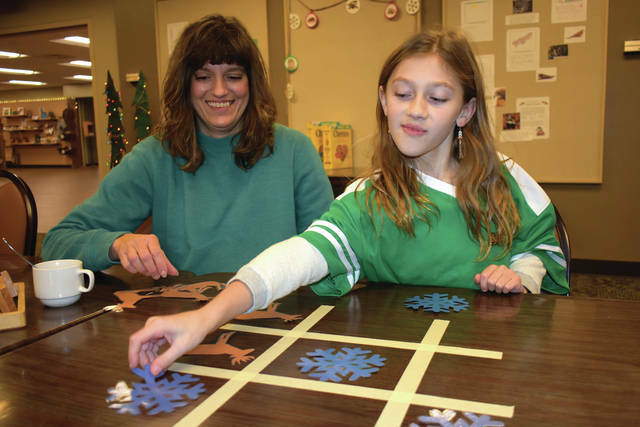 https://www.dailycall.com/wp-content/uploads/sites/30/2018/12/web1_BruknerHoliday1.jpgCody Willoughby | Troy Daily News Junior volunteer Cailyn Starnes helps Braxton Schultz, 4, of Tipp City make a peanut butter pine cone treat for animals during the annual “Winter Party for the Wildlife” on Saturday at Brukner Nature Center. The free event allowed participating families to enjoy arts and crafts, treat-making for wildlife, visits with the center’s resident critters, and a guided tour along the trails. Donations, such as bird seed, fruits and vegetables, and cleaning products, were requested to benefit the center’s wildlife ambassadors in 2019. For more information, visit www.bruknernaturecenter.com.